30 x 30cm oil on linen. Persian fairy tales are wonderful. Actually, that's probably true of most fairy tales. I digress. How captivating is a giant benevolent peacock so old that it knows the knowledge of all the Ages, which purifies the land and waters and acts as mediator and messenger between the earth and sky? It gets better. This Simurgh roosts in Saena, "the Tree of Life, which stands in the middle of the world sea Vourukhasa. The plant is potent medicine, is called all-healing, and the seeds of all plants are deposited on it. When the Simurgh takes flight, the leaves of the Tree of Life shake making all the seeds of every plant fall out. These seeds floated around the world on the winds of Vayu-Vata and the rains of Tishtrya, in cosmology taking root to become every type of plant that ever lived, and curing all the illnesses of mankind." (From Wikipedia) Just wow. 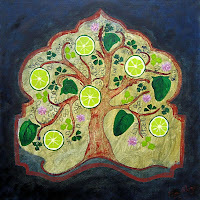 So this painting is inspired by this magical Persian take on cosmology. In this version, all the greenery of this recipe is visible on the Tree of Life and the overall style is strongly influenced by the Persian folk art of this creation myth. OMG a winter stew that I actually like! In creating and testing recipes for winter I discovered that I'm really really truly not a fan of stew. I think I find an entire bowl of sloppy winter vegetables just a bit boring. Which come to think of it is rather odd as I LOVE thick chunky soups. Go figure. Anyway, where I was heading is that I tried stews from cultures all over the world. From the many that were translated into vege versions, this is the only one which made me sit up and go 'wow, that worked'. With all the flavour from the truckload of herbs in this dish, it is anything but dull. Saute the onion in the oil in a very big pot until a deep golden colour. Add turmeric and fry for a minute or two. Fry until potatoes are browned. Add greens and fry, stirring, until greens deepen in colour and darken. Add stock, kidney beans, lime juice and cinnamon. Simmer, covered, for 30 mins or until potatoes are well cooked. Check seasoning for salt, pepper and lime juice. Serves 3. Yes that's an odd quantity.